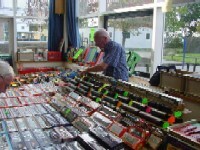 This year we held our 52nd Annual Model Railway Exhibition. St. Edwards School, London Road, Romford RM7 9NX. 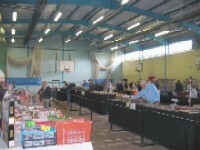 This was our third year here at St. Edwards School, and once again we were able to fill both halls with a wide variety of layouts, traders and demonstrations, including the latest in computer simulations, and old favourites like train rides! 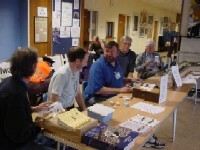 Our thanks as always to all invloved in the planning, preparation and running of the exhibition, in particular the hard working volunteers providing the refreshments. Braxted O Gauge Representing an imaginary ex-Great Eastern country branch line terminus, situated in North Essex near the Suffolk border, some time just before the second world war. Elkington-on-Sea Tramways On30 Trams A typical British seaside resort in the 1950's where, like Blackpool, the old trams still carry holidaymakers to the pier. 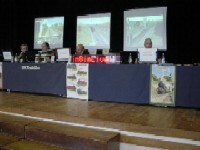 Fleischmann demonstration layout HO Gauge Fleischmann HO-scale continental demonstration layout, digitally controlled, depicting a mountainous area with a station, hidden sidings, automatic shunting and rack railway. Fursenhall EM Gauge The imaginary market town of Fursenhall is to the east of Cambridge, and is served by a single-track branch from the GN/GE line. The period depicted is the fifties, as steam gave way to diesel. 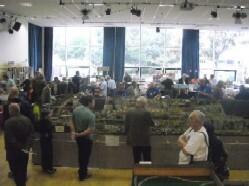 Hedge Lane 3mm Scale Exhibition layout built by the South West Essex Group of the Three Millimetre Society and intended to be a trainspotter's paradise! It is not based on any particular railway company and is set vaguely in the 1950's when the occasional diesel loco could be seen amongst the still reigning steam locos. Hermosa, Tacoma & Cascade Western Railroad On30 Gauge The HT & CWR is to be found in the mountain wonderland of the San Juan country of south western Colorado, and is a branch of the Denver and Rio Grande Western Railroad. Lymeswold OO Gauge Lymeswold depicts a fictional seaside country branch line and can be operated with a variety of different stock and signals covering 3 eras: BR (E) 1950-60, SR 1935-38 and BR (W) 1955-65. Lynton & Barnstaple Railway (static display) 4mm Scale/9mm Gauge Modelled (originally by Robert Hardingham of Bexhill) on the Barnstaple Town to Braunston stretch of the Lynton & Barnstaple Railway. Minories EM Gauge Based on one of the classic layout plans: 'Minories' by Model Railway Club member Cyril Freezer, which was first published 50 years ago. Tal-y-Bont On30 Gauge This narrow gauge railway was built in 1896 to connect the gold mine at Tal-y-Bont, a quiet hamlet on the west bank of the River Conwy in North Wales, and the woollen mill at Trefriw, to the Market town of Llanwrst. Tamworth N Gauge Represents the station at Tamworth on the Trent Valley Line on the LNWR/LMS West Coast main line, London (Euston) to Glasgow (Central). 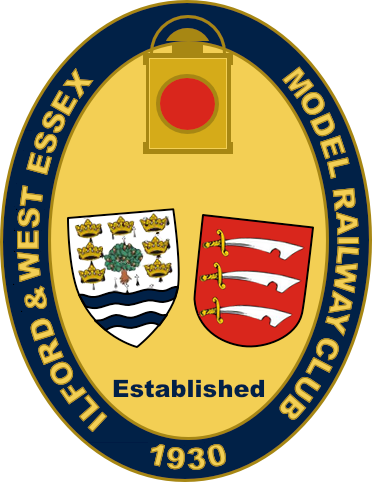 Featured 'Railway of the Month', Railway Modeller January 2005. Taw Magna O Gauge Taw Magna is a ficticious small town somewhere in the West Country, and the period depicted is around 1950, just after nationalisation. Thaxted OO Gauge The Thaxted branch opened in 1913 and closed in 1952 and ran between Elsenham on the line between Liverpool Street and Cambridge and the outskirts of Thaxted village. Featured in the September 1996 issue of British Railway Modelling. Woodknot Creek Mill N Gauge North American layout taken from a track plan in Model Railroader magazine.